The history of Ukraine has revealed the turning points in the history of Europe. On 25 May both Ukrainians and EU citizens can decide which way things will turn this time. Ukraine has no future without Europe, but Europe also has no future without Ukraine. The history of statehood on the territory of Ukraine begins with two archetypically European encounters. Medieval statehood on the territory of today’s Ukraine, like that of France and England, includes an encounter with Vikings. The men from the north sought to establish a trade route between the Baltic and Black Seas, and used Kyiv, on the Dnipro (Dnieper) River, as a trading post. Their arrival coincided with the collapse of an earlier Khazar state, and their leaders soon intermarried with the local Slavic-speaking population. Thus arose the entity known as Kievan Rus. Like all of the states of medieval eastern Europe, Rus was a pagan entity that did not so much convert to Christianity as choose between its western and eastern variants. Like all of its neighbours, it hesitated between Rome and Byzantium before its rulers chose the latter. Rus was seriously weakened by problems of succession before its destruction was ensured by the arrival of the Mongols in the first half of the thirteenth century. At this point the history of Rus fragments into parts. Most of the lands of Rus were gathered in by the Grand Duchy of Lithuania, an enormous warrior state with a capital in Vilnius. Its grand dukes styled themselves the inheritors of Rus and adapted many of its cultural achievements, such as its Slavic court language and legal traditions. Although the grand dukes were pagan Lithuanians, most of their subjects were eastern Christians. After the grand dukes of Lithuania became, by personal union, the kings of Poland, most of the lands of Ukraine were part of what was now the largest European state. Constitutional reforms of 1569 established this state as a republic known as the Polish-Lithuanian Commonwealth. In this “republic of two nations”, the lands of Ukraine were part of the Polish crown, and the lands of Belarus part of the Grand Duchy of Lithuania. In this way a new division was created within the old lands of Rus. This was the first epoch of oligarchic pluralism in Ukraine. Ukrainian noblemen took part as equals in the representative institutions of the republic, but the vast majority of the population was colonized in large estates that produced grain for export. Local warlords were joined by Polish noblemen as well as Jews, who helped to establish a feudal order in the country. It was in this era that Jews helped to create the small cities remembered as shtetls. This political system brought the Cossack rebellion of 1648, in which free men who had escaped the system challenged its logic. Fatefully, they allied with a rival state that had roots in ancient Rus, the Duchy of Muscovy. The city of Moscow had been on the eastern frontier of Rus, and unlike most of the territories of Rus it remained under direct Mongol control. Whereas the territories of today’s Belarus and Ukraine were in contact, through Vilnius and Warsaw, with the Renaissance and the Reformation, neither of these trends reached Moscow. Its break from Mongol rule is dated conventionally at 1480. The dukes of Moscow, like the grand dukes of Lithuania, styled themselves the inheritors of Kievan Rus. They did not however control Kyiv for nearly half a millennium after the destruction of that medieval state. For most of the time Kyiv was ruled from Vilnius and Warsaw. The Cossack rebellions began the decline of the Polish-Lithuanian Commonwealth and created the conditions for the shift of Kyiv from Polish to Muscovite rule. In 1667 the lands of today’s Ukraine were divided between the Commonwealth and Muscovy, with Kyiv on the Muscovite side. This permitted contact between Muscovy and Europe and educated elites from Kyiv’s university moved north to become professionals and officials in the growing empire. The pattern repeated itself when the Commonwealth was partitioned out of existence by Muscovy (by then known as the Russian Empire), Prussia and the Habsburg monarchy at the end of the eighteenth century. The Russian Empire, which had no tradition of higher education, exploited literate men trained in Vilnius and Kyiv. In the nineteenth century, the Ukrainian national movement also followed rather typical European patterns. Some of these educated men, lay and clergy, began to rebel against their own biographies and present the subject of history not as the elites but as the masses. The trend began in Kharkiv, and then spread to Kyiv and across the Russian-Habsburg border into Lviv. Ukrainian historians of the nineteenth century were leaders among the general European trend of romanticizing the common people, known in Ukraine as populism. This intellectual move also allowed for the imagination of a common Ukrainian nation across the border of the Russian Empire and the Habsburg monarchy (where a small territory known as eastern Galicia was home to speakers of the language we would call Ukrainian). As in the rest of eastern Europe, the Great War brought the end of traditional empire and attempts to establish a national state following the Wilsonian logic of self-determination. But in Ukraine the attempts were multiple, one on the Habsburg lands and one on the lands of the Russian Empire. The first was defeated by Poles, who succeeded in attaching eastern Galicia to their own new state. The second had to contend with both the Red Army and its White opponents, who even as they fought against each other agreed that Ukraine would be part of a larger political unit. Although the Ukrainian national movement was comparable to those of other east European territories, and although people fought and died in larger numbers for Ukraine than for most of the other emergent nation-states after 1918, the outcome was complete failure. After an enormously complicated series of events, in which Kyiv was occupied a dozen times, the Red Army was victorious, and a Soviet Ukraine was established as part of the new Soviet Union in 1922. Precisely because the Ukrainian movement was difficult to suppress, and precisely because Soviet Ukraine was a western borderland of the USSR, the question of its European identity was central from the beginning of Soviet history. Within Soviet policy was an ambiguity about Europe: Soviet modernization was to repeat European capitalist modernity, but only in order to surpass it. Europe might be either progressive or regressive in this scheme, depending upon the moment, the perspective and the mood of the leader. In the 1920s Soviet policy favoured the development of a Ukrainian intellectual and political class, on the assumption that enlightened Ukrainians would align themselves with the Soviet future. In the 1930s, Soviet policy sought to modernize the Ukrainian countryside by collectivizing the land and transforming the peasants into employees of the state. This brought declining yields as well as massive resistance from a peasantry that believed in private property. Joseph Stalin transformed these failures into a political victory by blaming them upon Ukrainian nationalists and their foreign supporters. He continued requisitions in Ukraine in the full knowledge that he was starving millions of human beings, and crushed the new Ukrainian intelligentsia. More than three million people were starved in Soviet Ukraine. The consequence was a new Soviet order of intimidation, where Europe was presented only as a threat. Stalin claimed, absurdly but effectively, that Ukrainians were deliberately starving themselves on orders from Warsaw. Later, Soviet propaganda maintained that anyone who mentioned the famine must be an agent of Nazi Germany. Thus began the politics of fascism and anti-fascism, where Moscow was the defender of all that was good, and its critics were fascists. This very effective rhetorical pose did not preclude an actual Soviet alliance with the actual Nazis in 1939. Given today’s return of Russian propaganda to anti-fascism, this is an important point to remember: the whole grand moral Manichaeism was meant to serve the state, and as such did not limit it in any way. The embrace of anti-fascism as a strategy is quite different from opposing actual fascists. Ukraine was at the centre of the policy that Stalin called “internal colonization”; it was also at the centre of Hitler’s plans for an external colonization. His Lebensraum was before all Ukraine. Its fertile soil was to be cleared of Soviet power and exploited for Germany. The plan was to continue the use of Stalin’s collective farms, but to divert the food from east to west. Along the way German planners expected that some thirty million inhabitants of the Soviet Union would starve to death. In this style of thinking, Ukrainians were of course subhumans, incapable of normal political life, fit only for colonization. No European country was subject to such intense colonization as Ukraine, and no European country suffered more: it was the deadliest place on earth between 1933 and 1945. In today’s Germany, colonial assumptions remain unexamined. Germans are reflective about crimes against Jews and against the Soviet Union (falsely remembered as Russia), but almost no one in Germany recognizes that the central object of German colonial thinking and practice was precisely Ukraine. German leaders as prominent as Helmut Schmidt do not hesitate, even today, to exclude Ukrainians from the normal precepts of international law. The idea that Ukrainians are not normal human beings persists, now with the vicious twist that Ukrainians are held responsible for the crimes in Ukraine that were in fact German policy and would never have taken place without a German war and German policies of colonization. Although Hitler’s main war aim was the destruction of the Soviet Union, he found himself needing an alliance with the Soviet Union to begin armed conflict. In 1939, after it became clear that Poland would fight, Hitler recruited Stalin for a double invasion. Stalin had been hoping for years for such an invitation. 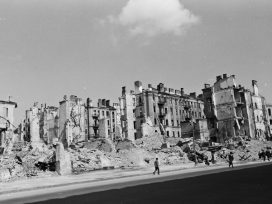 Soviet policy had been aiming at the destruction of Poland for a long time already. Moreover, Stalin thought that an alliance with Hitler, in other words cooperation with the European far Right, he thought, was the key to destroying Europe. A German-Soviet alliance would turn Germany, he expected, against its western neighbours and lead to the weakening or even the destruction of European capitalism. This is not so different from a certain calculation made by Vladimir Putin today, as we shall see. The result of the cooperative German-Soviet invasion was the defeat of Poland and the destruction of the Polish state, but also an important development in Ukrainian nationalism. In the 1930s, there had been no Ukrainian national movement in the Soviet Union: such a thing was impossible. There was however an underground terrorist movement in Poland known as the Organization of Ukrainian Nationalists (OUN). It was little more than an irritant in normal times, but with war its importance grew. The OUN opposed both Polish and Soviet rule of what it saw as Ukrainian territories, and thus regarded a German invasion of the east as the only way that a Ukrainian state-building process could begin. Thus the OUN supported Germany in its invasion of Poland in 1939 and would do so again in 1941, when Germany betrayed its ally and invaded the USSR. Meanwhile, the Soviet occupation of eastern Poland between 1939 and 1941 also favoured Ukrainian nationalism. The Polish ruling classes and the leaders of traditional Ukrainian political parties were deported or killed. Ukrainian nationalists, used to life underground, fared better. Ukrainian leftwing revolutionaries, who had been quite numerous before the war, often shifted to the radical Right after experience with Soviet rule. In addition, the Soviets themselves assassinated the leader of the Organization for Ukrainian Nationalists, which brought a struggle for power between two younger men, Stepan Bandera and Andrii Melnyk. Ukrainian nationalists tried political collaboration with Germany in 1941, and failed. Hundreds of Ukrainian nationalists joined in the German invasion of the USSR as scouts and translators, and some of them helped the Germans organize pogroms. Ukrainian nationalist politicians tried to collect their debt by declaring an independent Ukraine in June 1941. Hitler was completely uninterested in such a prospect. Much of the nationalist leadership was killed or incarcerated. Stepan Bandera himself spent most of the rest of the war in Sachsenhausen. Some Ukrainians continued to collaborate with the hope of gaining military experience or of some future political reversal when the Germans might need them. But in occupied Ukraine, as everywhere in Europe, the vast majority of practical collaboration had little to do with politics. As the war continued many Ukrainian nationalists prepared themselves for a moment of revolt when Soviet power replaced German. They saw the USSR as the main enemy, partly for ideological reasons, but mainly because it was winning the war. 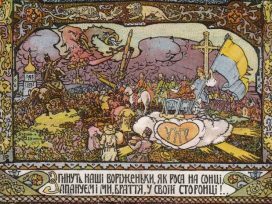 In Volhynia, Ukrainian nationalists established a Ukrainian Insurgent Army whose task was to somehow defeat the Soviets after the Soviets had defeated the Germans. Along the way it undertook a massive and murderous ethnic cleansing of Poles in 1943, killing at the same time a number of Jews who had been hiding with Poles. This was not in any sense collaboration with the Germans, but rather the murderous part of what its leaders saw as a national revolution. The Ukrainian nationalists did then fight the Soviets in a horrifying partisan war, in which the most brutal tactics were used by both sides. It was Nikita Khrushchev who ordered that the Soviets exceed the nationalists in brutality to cow the local population. The political collaboration and the uprising of Ukrainian nationalists were, all in all, a minor element in the history of the German occupation. As a result of the war something like six million people were killed on the territory of today’s Ukraine, including about 1.5 million Jews. 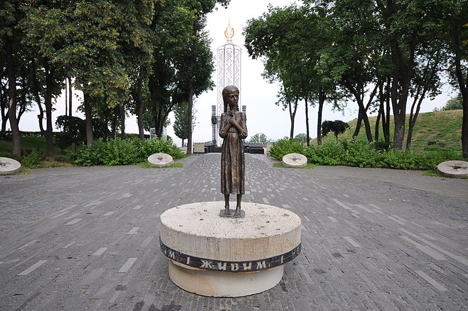 The Germans developed the techniques of mass killing at Kamyanets-Podilsky and Babyn Yar, where more than twenty thousand and then more than thirty thousand Jews were killed by mass shooting. Throughout occupied Soviet Ukraine local people collaborated with the Germans, as they did throughout the occupied Soviet Union and indeed throughout occupied Europe. But far, far more people in Ukraine were killed by the Germans than collaborated with them, something which is not true of any occupied country in western Europe. For that matter, far, far more people from Ukraine fought against the Germans than on the side of the Germans, which is again something which is not true of any west European country. The vast majority of Ukrainians who fought in the war did so in the uniform of the Red Army. More Ukrainians were killed fighting the Wehrmacht than American, British and French soldiers – combined. In Germany these basic facts are invisible because the Red Army is falsely seen as a Russian army, an identification insisted upon by the propaganda of today’s Russia. If the Red Army is a Russian army, then Ukrainians must have been the enemy. This line of thinking was invented by Stalin himself at the end of the war. The idea of the Great Fatherland War had three purposes: it started the action in 1941 rather than 1939 so that the Nazi-Soviet alliance was forgotten, and it placed Russia at the centre of events even though Ukraine was much more at the centre of the war, and it ignored Jewish suffering completely. It is the propaganda of the post-war period much more than the experience of the war that counts in the memory politics of today. No one in power now remembers the Second World War, although some Russian leaders seem to believe the version that they were taught as children. The leading Russian politicians of today are children of the 1970s, and thus of the Brezhnevian cult of the war. The Great Fatherland War became more simply Russian, without Ukrainians and Jews. The Jews suffered more than any other Soviet people, but the Holocaust as such had no place in Soviet history. It appeared mainly in propaganda directed to the West, in which the suffering of Jews was blamed entirely on Ukrainian and other nationalists – people who lived on the territories Stalin had conquered during the war as Hitler’s ally in 1939, and people who had resisted Soviet power when it returned in 1945. This is a tradition, to which Russian propagandists have returned in today’s Ukrainian crisis: total indifference to the Holocaust except as a political resource useful in manipulating people in the West. In the 1970s, the Soviet Union itself was Russified, in a certain special way. The ideological conclusion was drawn that classes exist within the Soviet Union itself and not within individual nations. Thus the USSR needed only one thinking class, and not multiple national ones. As a result the Ukrainian language was driven from schools, and especially from higher education. It remained as a language of low culture and, paradoxically, of very high culture, as even at this point no one in the USSR denied the existence of a distinct Ukrainian tradition in the arts and humanities. 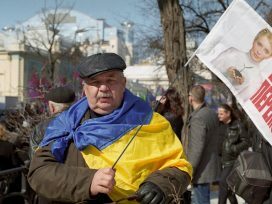 In this atmosphere Ukrainian patriots, and even Ukrainian nationalists, embraced a civic understanding of Ukrainian identity. They were aided in this by Polish émigré intellectuals, who in the 1970s and 1980s were defining a future foreign policy for a period after communism. 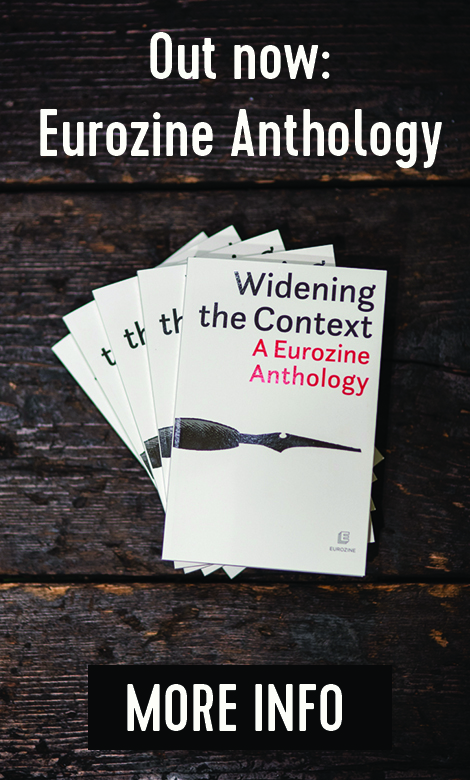 These thinkers, grouped around Jerzy Giedroyc and the journal Kultura in Paris, argued that Ukraine was a nation in the same sense as Poland and that a future independent Poland should recognize a future independent Ukraine – without challenging its borders. This was controversial at the time, because Poland lost the lands now known as western Ukraine as a result of the war. In retrospect it was a first step, for both Ukraine and Poland, towards the legal and intuitional norms of post-war Europe. The preemptive recognition of Ukraine within its existing borders became the basis for a Polish foreign policy of “European standards” in 1989. In the crucial period between 1989 and 1991, and for the first time in history, Ukrainian national activists only had one opponent: the Soviet Union. In December 1991, more than 90 per cent of the inhabitants of Soviet Ukraine voted for independence (including a majority in all regions of Ukraine). Russia and Ukraine then went their separate ways. Privatization and lawlessness led to oligarchy in both countries. In Russia the oligarchs were subdued by a centralized state, whereas in Ukraine they generated their own sort of pluralism. Until very recently all presidents in Ukraine oscillated between east and west in their foreign policy and among oligarchic clans in their domestic loyalties. What was unusual about Viktor Yanukovych is that he tried to end all pluralism, not only the popular sort but the oligarchic sort as well. In domestic policy he generated a fake democracy, in which his favoured opponent was the far-right party Svoboda. In so doing, he created a situation in which he could win elections and in which he could tell foreign observers that he was at least better than the nationalist alternative. In foreign policy he found himself pushed towards the Russia of Vladimir Putin, not so much because he desired this as such, but because the way in which he ruled made substantial cooperation with the European Union difficult. Yanukovych seems to have stolen so much from state coffers that the state itself was on the point of bankruptcy in 2013, which also made him vulnerable to Russia. Oscillating between Russia and the West was no longer possible. By 2013 however Moscow no longer represented simply a Russian state with more or less calculable interests, but rather a much grander project of Eurasian integration. The Eurasian project had two parts: the creation of a free trade bloc of Russia, Ukraine, Belarus and Kazakhstan, and the destruction of the European Union through the support of the European far Right. Imperial social conservatism provided the ideological cover for a goal that was eminently simple. The Putin regime depends upon the sale of hydrocarbons that are piped to Europe. A united Europe could generate an energy policy, under the pressures of Russian unpredictability or global warming – or both. But a disintegrated Europe would remain dependent on Russian hydrocarbons. Individual nation-states would be more pliable than the EU. Throughout 2013, media close to the Kremlin returned obsessively to the theme of European decadence, usually expressed in sexual terms. But the decay of Europe is not so much the reality perceived by the Putin regime as the goal of its policy. Just as soon as these vaulting ambitions were formulated, the proud Eurasian posture crashed upon the reality of Ukrainian society. In late 2013 and early 2014, the attempt to bring Ukraine within the Eurasian orbit produced exactly the opposite result. 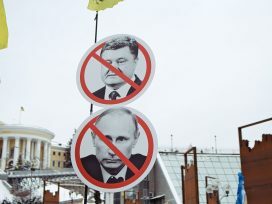 First, Russia publically dissuaded Yanukovych from signing a trade agreement with the EU. This brought protests in Ukraine. Then Russia offered a large loan and favourable gas prices in exchange for crushing the protests. Russian-style laws introduced in January transformed the protests into a mass movement. Millions of people who had joined in peaceful protests were suddenly transformed into criminals and some of them began to defend themselves against the police. Finally, Russia made clear, both privately and publically, that Yanukovych had to clear Kyiv of protestors in order to receive the money. Then followed the sniper massacre of February, which gave the revolutionaries a clear moral and political victory, and forced Yanukovych to flee to Russia. The Eurasian Union could only be a club of dictatorships, but the attempt to create dictatorship in Ukraine led to an outcome exactly the opposite of what was desired: the return of parliamentary rule, the announcement of presidential elections, and a foreign policy oriented towards Europe. None of this would have happened without the spontaneous self-organization of millions of Ukrainians on the Maidan in Kyiv and throughout the country. This made the revolution in Ukraine not only a disaster for Russian foreign policy, but a challenge to the Russian regime at home. 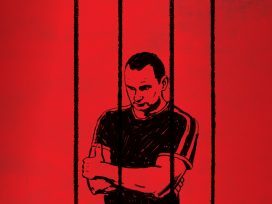 The weakness of Putin’s policy is that it cannot account for the actions of free human beings who choose to organize themselves in response to unpredictable historical events. Its strength is its tactical dexterity and ideological shamelessness. Thus Eurasia was very quickly modified: it was no longer a dictators’ club and the attempt to destroy the EU, but rather the attempt to destabilize the Ukrainian state and the EU at the same time. Russian propaganda presented the Ukrainian revolution as a Nazi coup and blamed Europeans for supporting these supposed Nazis. This version, although ridiculous, was much more comfortable in Putin’s mental world, since it removed from view the debacle of Russian foreign policy in Ukraine, and replaced spontaneous action by Ukrainians with foreign conspiracies. The Russian invasion and occupation of the Ukrainian province of Crimea was a frontal challenge to the European security order as well as to the Ukrainian state. It created the temptation for Germans and others to return to the traditional world of colonial thinking, ignoring decades of law and regarding the Ukrainians as unworthy of statehood. The Russian annexation was carried out, tellingly, with the help of Putin’s extremist allies throughout Europe. No reputable organization would observe the electoral farce by which 97 per cent of Crimeans supposedly voted to be annexed. But a ragtag delegation of rightwing populists, neo-Nazis and members of the German party Die Linke (the Left Party) were happy to come and endorse the results. The German delegation to Crimea was composed of four members of Die Linke and one member of Neue Rechte (New Right). This is a telling combination. Die Linke operate within a certain virtual reality created by Russian propaganda, in which the task of the European Left is to, from Moscow’s perspective, criticize the Ukrainian Right – but not the European Right, and certainly not the Russian Right. Now, there is some basis for such criticism. Ukraine does have a far Right and its members do have some influence. Svoboda, which was Yanukovych’s house opposition, liberated itself from this role during the revolution. In the current Ukrainian government it holds four of twenty portfolios. This overstates both its electoral support, which is about three per cent, and its representation in parliament. Some of the people who fought the police during the revolution, although by no means a majority, were from a new group called Right Sector, some of whose members are radical nationalists. Its presidential candidate is polling at below two per cent, and the group itself has something like three hundred members. There is support for the far Right in Ukraine, although less than in most members of the European Union. A revolutionary situation always favours extremists, and watchfulness is certainly in order. It is quite striking, however, that Kyiv and Ukraine returned to order immediately after the revolution and that the new government has taken an almost unbelievably calm stance in the face of Russian invasion. The only scenario in which Ukrainian extremists actually come to the fore is one in which Russia actually tries to invade the rest of the country. If presidential elections proceed as planned in May, then the unpopularity and weakness of the Ukrainian far Right will be revealed. This is why Moscow opposes those elections. People who criticize only the Ukrainian Right often fail to notice two very important things. The first is that the revolution in Ukraine came from the left. Its enemy was an authoritarian kleptocrat, and its central program was social justice and the rule of law. It was initiated by a journalist of Afghan background, its first two mortal casualties were an Armenian and a Belarusian, and it was supported by the Muslim Crimean Tatar community as well as many Ukrainian Jews. A Jewish Red Army veteran was among those killed in the sniper massacre. Multiple IDF veterans returned from Israel to Ukraine to fight for freedom. The Maidan functioned in two languages simultaneously, Ukrainian and Russian, because Kyiv is a bilingual city, Ukraine is a bilingual country and Ukrainians are bilingual people. Indeed, the motor of the revolution was the Russian-speaking middle class of Kyiv. The current government is unselfconsciously multiethnic and multilingual. Ukraine is a cosmopolitan place where considerations of language and ethnicity count for less then we think. In fact, Ukraine is now the site of the largest and most important free media in the Russian language, since all important media in Ukraine appear in Russian, and since freedom of speech prevails. Putin’s idea of defending Russian speakers in Ukraine is absurd on many levels, but one of them is this: people can say what they like in Russian in Ukraine, but they cannot do so in Russia itself. This is the second thing that goes unnoticed: the authoritarian far Right in Russia is infinitely more dangerous than the authoritarian far Right in Ukraine. It is in power, for one thing. It has no meaningful rivals, for another. It does not have to accommodate itself to international expectations, for a third. And it is now pursuing a foreign policy that is based openly upon the ethnicization of the world. It does not matter who an individual is according to law or his own preferences: the fact that he speaks Russian makes him a Volksgenosse requiring Russian protection, which is to say invasion. The Russian parliament granted Putin the authority to invade the entirety of Ukraine and to transform its social and political structure, which is an extraordinarily radical goal. It also sent a missive to the Polish foreign ministry proposing a partition of Ukraine. On popular Russian television, Jews are blamed for the Holocaust; in the major newspaper Izvestiia, Hitler is rehabilitated as a reasonable statesman responding to unreasonable western pressure. The pro-war demonstrations supporting the invasion of Ukraine are composed of people who wear monochrome uniforms and march in formation. The Russian intervention in eastern Ukraine involves generating ethnic violence, not suppressing it. The man who raised the Russian flag in Donetsk was a member of a neo-Nazi party. All of this is consistent with the fundamental ideological premise of Eurasia. Whereas European integration begins from the premise that National Socialism and Stalinism were negative examples, Eurasian integration begins from the more jaded and postmodern premise that history is a sort of grab bag of useful ideas. Whereas European integration presumes liberal democracy, Eurasian ideology explicitly rejects it. The main Eurasian ideologist, Alexander Dugin, who once called for a fascism “as red as our blood”, receives more attention now than ever before. His three basic political ideas – the need to colonize Ukraine; the decadence of the European Union; and the desirability of an alternative Eurasian project from Lisbon to Vladivostok – are now all officially enunciated, in less wild forms than his to be sure, as Russian foreign policy. President Putin presents Russia today as an encircled homeland, not of the revolution as the communists used to say, but of the counter-revolution. He portrays Russia is a special civilization which must be defended at all costs, even though it generates power in Europe and the world through its rather generic collection of reactionary mantras and its accidental possession of hydrocarbons. More than anything else, what unites the Russian leadership with the European far Right is a certain basic dishonesty, a lie so fundamental and self-delusive that it has the potential to destroy an entire peaceful order. Even as Russian leaders pour scorn on a Europe they present as a gay fleshpot, Russia’s elite is dependent upon the European Union at every conceivable level. Without European predictability, law and culture, Russians would have nowhere to launder their money, establish their front companies, send their children to school, or spend their vacations. Europe is both the basis of the Russian system and its safety valve. Likewise, the average Heinz-Christian Strache (FPÖ in Austria) or Marine Le Pen (Front National in France) voter takes for granted countless elements of peace and prosperity that were achieved as a result of European integration. The archetypical example is the possibility, on 25 May, to use free and fair democratic elections to the European parliament to vote for people who claim to oppose the existence of the European parliament. Like Putin, Strache and Le Pen propose an obvious contradiction: all of the benefits of European peace and prosperity will somehow remain, even as Europeans return to some form of national state. But this, of course, is a utopia as stupid as it is colourless. There is no nation-state to which anyone can return. The only alternatives in a globalized world are various forms of interaction. For countries like France or Austria, or for that matter Greece, Bulgaria and Hungary, the rejection of the European Union is the embrace of Eurasia. This is the simple objective reality: a united Europe can and most likely will respond adequately to an aggressive Russian petrostate, whereas a collection of quarrelling nation-states will not. The leaders of Europe’s rightwing parties no longer even attempt to hide that their escape from Brussels leads them into the arms of Putin. Their party members go to Crimea and praise the electoral farce as a model for Europe. Their allegiance, in almost every single case, is to Putin rather than to the supposedly far-Right Ukrainian government. Even Nigel Farage, the leader of the UK Independence Party, now shares Putin’s propaganda on Ukraine with millions of British viewers in a televised debate. Presidential elections in Ukraine are to be held on 25 May, which by no coincidence is also the day of elections to the European parliament. The ongoing Russian intervention in eastern Ukraine is meant to prevent these elections from taking place. In the next few weeks, Eurasia means the collaboration of the Kremlin and the European far Right as Russia tries to prevent the Ukrainian elections from happening at all, and as European nationalists try to win European elections. A vote for Strache or Le Pen or even Farage is now a vote for Putin, and a defeat for Europe is a victory for Eurasia. The return to the nation-state is impossible, so integration will continue in one form or another: all that can be decided is the form. Politicians and intellectuals used to say that there was no alternative to the European project, but now there is: Eurasia. Ukraine has no future without Europe, but Europe also has no future without Ukraine. Throughout the centuries, the history of Ukraine has revealed the turning points in the history of Europe. This seems still to be true today. Of course, which way things will turn still depends, at least for the next six weeks, on the Europeans.